I am a big fan of ghost movies, although most of them nowadays are a bit gory but I still love the idea of hearing something go bump in the night, reach out for you from the dark, scratchy little noises behind walls and ghostly apparitions who jump in your face. Of course, all from the safety of my couch. You wouldn’t catch me going near let alone going into a structure with a history of haunting. I would be a perfect target because I am one of those people that truly believe you have some real pissed off spirits out there that just love to give you a hard time. With most ghost movies now, that usually means getting decapitated or something as gruesome. No one gets to run out of the haunted house anymore because some how they are always locked in by spirit once they get you in there. What is it about these movies of violence, terror, carnage and mayhem that fascinates us? Why do audiences love to be terrified? There are basically eight ways horror movies have scared their audiences for decades. The fear of the unknown. The anticipation of what is around that next corner or in those dark shadows. The horrifying visuals that are embedded into our minds, especially on those lonely dark nights. The terrifying feeling of being chased by something or someone of unspeakable horror. The disfigured beings that haunt our nightmares. The presentations of phobias that have kept us up at nights. The locations that we never want to find ourselves in. And yes, the monsters that stalk, terrorize, haunt, and kill. The UnknownWhat the hell is behind the slowly creaking door, the bottom of the cellar stairs or the dark hallway? 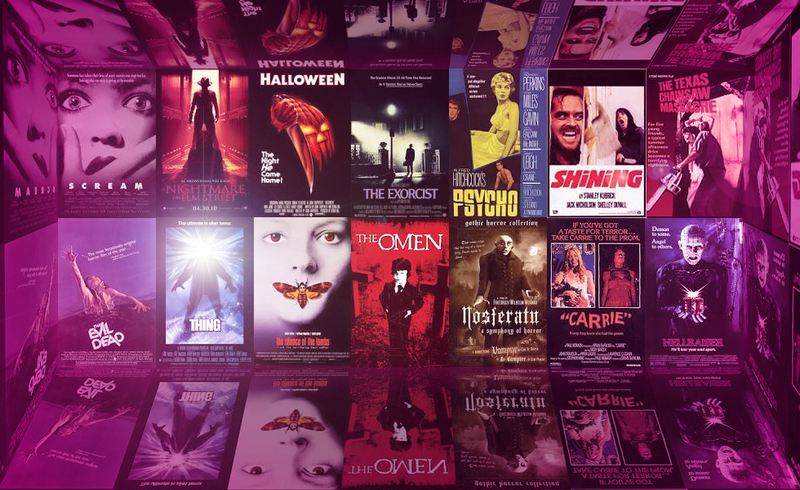 Audiences know there’s going to be a loud sound or a creepy visual but it gives us an adrenaline rush, which is exactly why horror movies are so popular and always have been. Certain imagery goes home with the audience and often stays with them for days, weeks, months, and sometimes for the rest of their lives. Remember the two little girls standing in the hall of the “Shining” or Linda Blair’s head spinning in the “Exorcist”? Slept with the lights on for two weeks after that one! There’s something about disfigured humans that mesmerizes audiences, going back to the old carny days complete with “freak” shows. Audiences are both mesmerized and horrified at the sight and horror movies accomplish that same dual feeling. Phobias are often defined as a “persistent, abnormal, or irrational fear of a specific thing or situation that compels one to avoid the feared stimulus. The horror movie sometimes offers you the unique opportunity of introducing a new fear. Whether it’s a ghost, alien, demon, deranged killer, creature or anything else that horror writers have conjured, they’re all monsters. And a horror film is only as good as its monster, they are the key to the success of the film. They have to pull those strings of fear, tension, and anxiety and unleash the primal instincts of survival with the audience. I have to agree on all counts of the eight ingredients to scare the living daylights out of you. We all have our preferences whether it be monster flicks, demons, ghosts or aliens but you have to feel transported to a place of feeling trapped without escape and then the realization it is only a movie. Phew! Celebration and enjoyment! The card truly represents those who get into the whole horror genre, they really, really like them! Depression, sadness and dealing with a situation in despair. This is a reach but I believe the card represents escapism from one’s own troubles in these movies. Creating a watcher feeling of: “God and I thought my life was f****d up!” lol! Melancholy and grieving. And then you have the horror movie lovers that just like the bad feeling you get watching what is happening to the people on the screen. Go figure?